Can Thai Massage be done on animals? Why should Thai Massage only work on humans? You are probably thinking that Thai Massage is a system of stretches, and that cannot be done on animals. But that’s not correct. Let’s redefine Thai Massage. In contrast to Swedish-style oil massage systems that are done directly on the skin and require taking off your clothes, Thai Massage is done fully dressed. Therefore it requires different techniques like pressure, kneading, rocking and stretching. Oil massage does not require movement on the part of the client, but Thai Massage uses lots of movement oriented techniques. While stretching is part of the system, it is not its main definition. It is entirely possible to do a full Thai Massage without any stretching. While stretching is generally neither appropriate nor necessary for animals, all the other techniques, i.e. pressure, squeezing, kneading and rocking, work on them just as well as on humans. Actually they work very well on animals. In contrast can you imagine doing an oil massage on your dog or cat? That clearly would not work on a furry creature. Let me tell you a story. Once I had an acquaintance who was interested in Thai Massage, but was not quite sure about it. One day I visited her in her home. She had a young dog whom she dearly loved and who was quite hyper. You know the kind – running all over the place, jumping up and down on you, constantly in motion and easily excited. But the dog was friendly and cute, so I squatted down and started to massage it. With animals you have to tone down your techniques. On big humans you can use forearms, knees, elbows and feet, but on a dog you will just use your palms and fingertips. Otherwise it is the same. So I kept working on the dog, and she kept getting quieter and quieter, obviously enjoying the session while her owner was watching attentively. After maybe ten minutes the animal was lying down in a totally relaxed mode and went into a trance-like state. Even after I stopped working on her, she was lying there motionless and obviously at peace and totally content. Her owner was amazed and said that she could normally never get the dog to relax like that. After seeing the effect that my treatment had on her dog, she immediately decided that she wanted a session as well. My little impromptu dog massage gained me the trust and patronage of a new client. And for me it was a wonderful experience to see that Thai Massage is much less limited than we might think. Animals instinctively know that. Actually it also works the other way round. 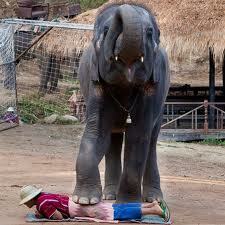 In Thailand you can get a “Thai Massage” from an elephant. Just like I had to tone down my massage techniques for the puppy, somehow the elephant knows to tone down it’s techniques for the humans as well. I have to admit that I have not tried it (and am not going to), but it is a popular affair in some areas of Thailand. I still prefer the human touch for my massages. The elephant massage is mostly a stunt designed for the photo albums of the tourists. It is right up there with hugging tigers which is also happening in several places in Thailand. Here is the bottom line: Let’s expand our definitions of what can be done with massage and let’s be creative! Our pets will appreciate it. Thai Massage can be done by professional therapists, it works great for helping friends and family with their aches, you can use it on your pets, it blends in great with yoga practice, and it even works well on pregnant women. The author, Shama Kern, is the founder of Thai Healing Massage Academy. He has been practicing and teaching Thai Massage for 18 years, and he is the creator of 20 online Thai Massage training courses. Great post. I knew Thai was good because of being clothed and no oil, but I never thought beyond humans. Great story about getting a client through the dog. Our school offers a couple levels of Thai, I’ll have to inquire with our instructor, David Weitzer, about applying to animals. thanks for your comment. 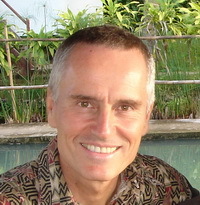 By the way, David and I go back a long time and have met and talked in Chiang Mai, Thailand, many times over the years. Its interesting to look at the work of Linda Tellington-Jones. She originally started working with horses and moved on to dogs and other animals. Her work is like an offshoot of Feldenkrais. She now has qualified practitioners all over the world doing what she calls TTouch. http://www.ttouch.com. Its a system of circular touches. I saw a practitioner do work on an injured horse and it was fascinating to feel the horse go into a deeper relaxation state. Here is the youtube video I made of the session. http://www.youtube.com/watch?v=kPCVyiMH0t4. It also works for humans. Maybe some connection to your style of Thai Massage. I hope its OK including links. Thanks for this interesting information Graham. Using therapeutic techniques on animals can work very well. I will check the ttouch site out some more. Thank you for sharing your experience , is useful story . Hello Shama, I greatly enjoyed your story. I will try apply massage to my pets, although they actually don’t need it, for they are always relaxed, they can give us a lesson of relaxation. Lydia, your pets probably don’t need the massage, but they will surely enjoy it a lot. For me it is always fun to massage animals because they have this unrestricted ability to relax into it and just enjoy it. They don’t have any issues about being touched. Hello Shama, It’s time I told you how much I enjoy reading your articles. Even though I’m more into lymphatic massage, I must say that I’m touched by the compassion and creativity that characterizes your approach to this very special profession. Please keep on writing and inspiring. Hi Steve, thanks for your kudos, I really appreciate it and it means a lot to me. My pet kitty, Mutzi, always watches the Thai Back Massage videos with me while sitting on my lap. I think she likes Shama’s calm voice. She gets to be my first “victim” for trying out techniques using fingers, thumbs, hands, and even forearms (she’s a pretty big cat). Mutzi either likes it or not–and lets me know it! Yes, animals are not shy or diplomatic when it comes to letting us know if they like our touch or not. I have never heard of such a course in Thailand. I think this is something you would have to modify and implement yourself. My name is Adam from France. I have a pet grooming and massage school. Your society is very interesting. I want to know, if you could be interested to make tutorial videos for dog massage. We could come With my wife in order to record video. Please answer me. Thank you very much. Hi Adam, while I intuitively know how to work on animals, I don’t think I have such specialized knowledge about applying Thai Massage on dogs that I could make a tutorial video about it. 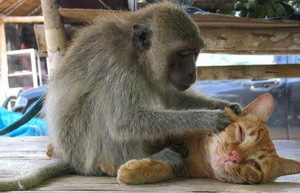 Most of Thai Massage is not really suited for animals since it involves many stretches which no animal needs. Animals just need loving touch, and for that you don’t need Thai Massage.